Come Sail with the Aggie Yacht Club! 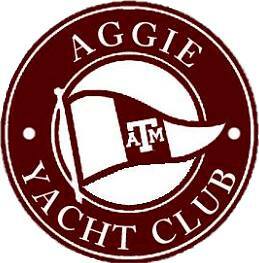 ﻿All members are required to complete a new member form when they initially join the Aggie Yacht Club, and must pay dues each semester to support club boats, maintenance, and other activities. The new member form can be downloaded in PDF form by clicking on the button to the right. Print the form, fill it out, and get it to a club officer at either an All-Hands Meeting or Learn to Sail Class. The member handbook describes what you can expect from your time with the club, as well as what the club expects of each member. The handbook also includes worksheets that members can use to follow along with our Learn to Sail class. Extras like directions to boatyards and other useful sailing resources are included as well. Dues are $45 per semester, and can be paid by clicking on the "Member Dues" button to the right. This will open a new window that takes you to the secure Texas A&M Marketplace where you can pay your membership dues. If a new window does not open, be sure you allow pop-ups for this page.